Tropical Storm (Post Tropical Cyclone) Hermine continues to make its way up the coast. There are Tropical Storm warnings for Delaware and New Jersey coastal areas as they are expected to take the brunt of the storm. Governor Chris Christie of New Jersey and Governor Jack Markell of Delaware have already declared States of Emergency ahead of the storm. All predicted tracks have the storm turning back towards land slightly and sticking around off the coast for a few days. 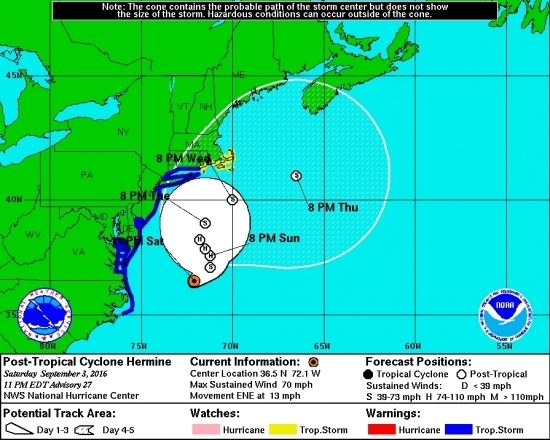 Hermine could intensify back into a Category 1 hurricane now that its back over warm water. The biggest impact will come from the winds, rough surf, storm surge, and coastal flooding. High tides down the shore the next few days will be around 10 a.m. and 10 p.m. There is also the potential for heavy rainfall over 2". In the Philadelphia area we will feel increasing winds and the chance of some rain Sunday and Monday. Two Cumberland County men have been arrested following a shooting that left one man dead and an Atlantic City police officer critically injured. 19-year-old Martell Chisholm of Millville and 28-year-old Demetrius Cross of Bridgeton are charged with two counts of attempted murder in the 1st degree, three counts of robbery in the 1st degree and related offenses. The incident happened around 2:30 a.m. near the Caesars Atlantic City parking deck. Two officers on patrol observed a group of six males and what appeared to be a robbery in progress. When they got out of the patrol car they were fired upon. One of the officers was struck and injured. The second officer returned fire, striking and killing 25-year-old Jerome Damon of Camden. The other five fled the scene. They were all eventually located during the day Saturday. The investigation determined that three of those men were actually the victims of Chisholm, Cross, and Damon. The officer has not been identified. He was taken to AtlantiCare Regional Medical Center where he remains in critical condition. The body of a woman was found late Saturday morning the Philadelphia's Frankford neighborhood. The woman, believed to be in her late 20's or early 30's, was discovered in a rear driveway of a building on the 2100 block of Scattergood Street. She was partially clothed and had a cardboard box on her head. There is no word on cause of death or identity. The investigation continues.